During my trip to Scotland, Royal Dornoch was by far the most out of the way course. It sits roughly four hours north of Anstruther, our first home base during our trip to the UK. So why go to the trouble to play it? Friends who had been lucky enough to play the course raved about it. I knew it was ranked highly on just about every list of top golf courses. 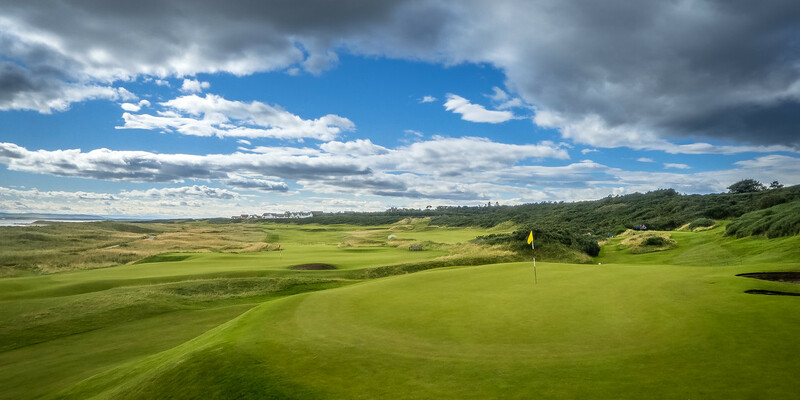 Tom Watson described the experience as “the most fun I’ve ever had playing golf.” The other reason I was interested in visiting Dornoch was because it’s the childhood home of Donald Ross. If you care at all about golf architecture and its history then visiting the hometown of one of the most famous men in golf is a worthwhile journey. One of the first things that strike many golfers upon their arrival to Royal Dornoch are the tour buses in the parking lot. Much like Royal Portrush, golfers will travel from far and wide to check out the famous links. On one hand, this is a great thing. I respect anyone interested enough to make the journey all the way up here to likely play a single golf course. On the other hand, to bus in and then bus out, not stepping foot in town, means the golfer has missed an absolutely charming little town. Everyone we met was very friendly, from the bed and breakfast where we stayed to the pubs around town. And the coolest thing is how proud they are of their golf course. They know they are sitting with an international treasure in their backyard yet there is no hint of arrogance or snobbery, just a welcoming and friendly vibe. The entrance to Royal Dornoch is very understated. There are no fancy gates. The locker room and pro shop are nice enough but not pretentious. As far as I could tell the only practice area was the putting green out next to the first tee. It’s all about the golf course. And what a golf course it is. Quite often reviews of golf courses talk about how “the land seems like it was meant for a golf course.” It’s usually something along the lines of “the course practically laid itself out.” I’m not a golf course architect, but if I was I’m not sure that I would take statements like those very well. It seems really difficult to build any golf course, much less a good one. I would imagine the goal of an architect it to make it seem as if the course was meant to be there, but that actual process is very challenging. All that said, if I have ever seen property that seems to cry out for a golf course, Royal Dornoch is it. I could not imagine a better piece of property on which to play golf. Possibly the best thing about the golf course is the routing. It is a very traditional out and back, links golf set-up. You tee off on number one heading away from the clubhouse, play the next eight holes outward, then turn around and play 10 back towards the clubhouse. 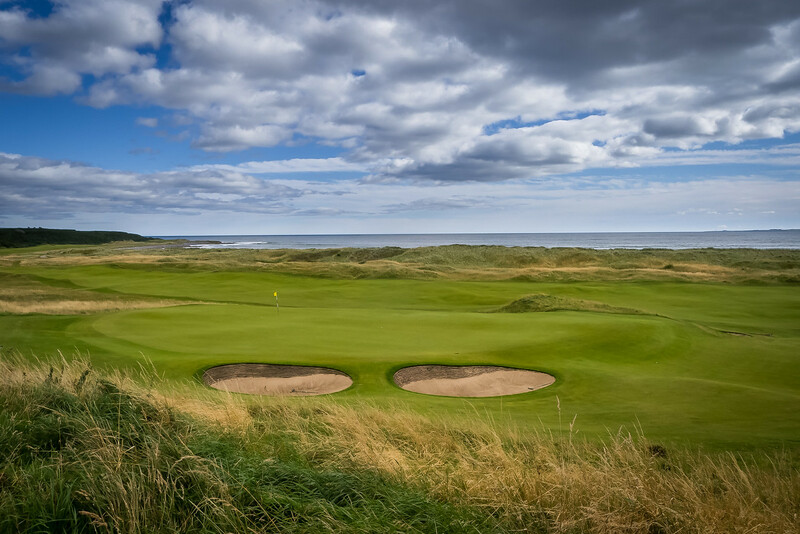 The first eight are played on an upper ridge followed by the remaining holes dropping down along the sea. It’s almost as if the two halves of the course are like stair steps with gorse and the 50-foot drop providing the separation. One might think that a simple out and back routing might be boring. Nothing could be further from the truth. As the round unfolds and you move away from the clubhouse the beautiful Dornoch Firth comes into view. 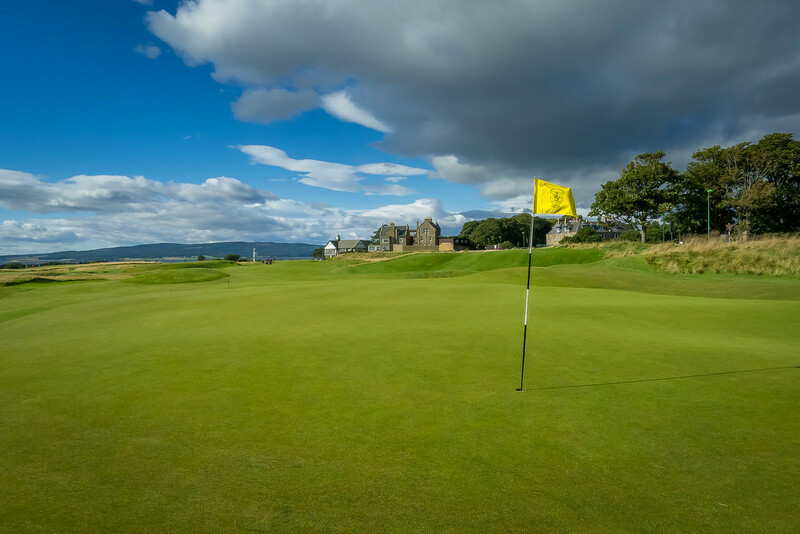 Playing golf at Royal Dornoch is one of those “good to be alive” points in your life where it’s hard to imagine a more beautiful place to be. The beauty crests at the 8th hole where the fairway drops roughly 40 feet down to the lower part of the golf course. Standing on top of the ridge before you walk down, looking over what seems like the entire golf course, was one of the highlights of my trip to Scotland. 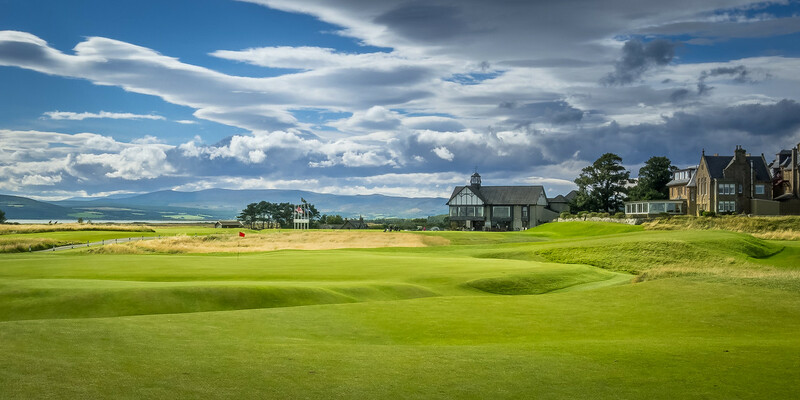 Obviously Royal Dornoch is a beautiful golf course. People travel from everywhere to play it. But how difficult is it? While I would put it a notch below Portrush and County Down in terms of difficulty, it is still a very tough track. The day I played the first 8 holes played directly downwind. It was a perfect day for links golf, playing those low shots that land short of the green then run up onto the putting surface. The back nine however played directly into the teeth of the wind. On the 14th, the famous “Foxy”, I hit driver/3-wood to pin high. 18 is one of the harder finishing holes you’ll find in the UK. From the men’s tees it played almost 450 yards directly into the wind. I again hit a drive, then 3-wood, both on the screws, only this time I was on the front fringe, the green guarded by a small swale in front. As I was leaving the golf course after my day at Royal Dornoch, clubs over my shoulder as I walked back to our B&B, I noticed something interesting. The course all day had been packed with tourists, but at this point in the evening it was nearly empty. It was around 6 pm in the evening and the weather was absolutely perfect on this September day. The only reason I wasn’t out playing more golf was because I was thoroughly exhausted after two weeks of golf and sightseeing. What was interesting was the local members seemed to be streaming onto the grounds to catch the last couple hours of daylight and enjoy their fantastic course. And by streaming in I mean walking in; no cars, no buses, just people carrying their clubs who appreciate great golf and are lucky enough to have this gem in their backyard. 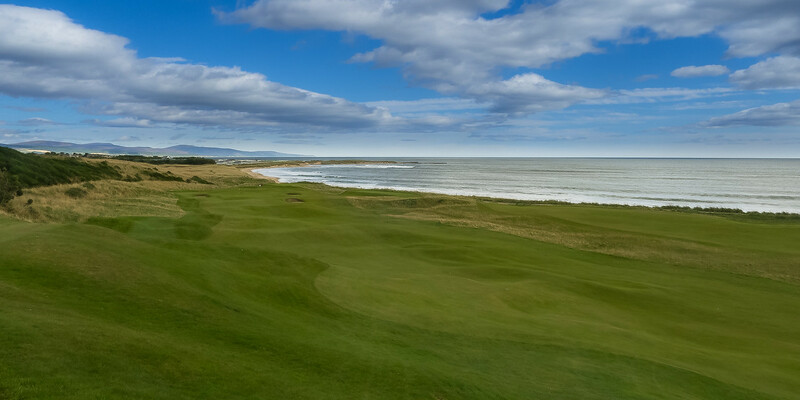 If I ever wanted to get away from everything for a few months and just write, play golf, take pictures, and decompress, Dornoch would be where I’d go. The town and golf course left such an impression on me that I’ll never forget them. Maybe Tom Watson was right, it is about as much fun as you can have playing golf. If you liked the photography in this post click here to go to my website and view the full-size images.